Thai badminton queen Ratchanok Intanon is back with a bang - more "confident" of herself against her opponents - as she blasted, Carolina Marin, Europe's lone hope, in the final, in the USD350,000 Perodua Malaysia Masters which ended in Kuala Lumpur on Sunday. The 23-year-old Intanon's 21-9, 22-20 win over the Spaniard in 41 minutes to retain the title was another great stride in Asia's continued dominance in the shuttle sport. Asians won all the five titles at stake. Intanon needed only 15 minutes to take the first game as she blew away the Spaniard's ego and arrogance that silenced her trademark shrieks often heard in the stadium when she gets a point. "My confidence is back and I would not have asked for a better start to the year," said the Thai, known for her infectious smile. She pocketed USD26,250 for her title. Europe's pride was also dented when defending men's singles champion Viktor Axelsen of Denmark was bundled out of the tournament in the semi-finals by China's reigning Olympic champion Chen Long who won 21-13, 21-14. Chen Long, however, fell at the final hurdle against South Korean Son Wan-ho. The 30-year-old Korean had extra reason to smile in his 21-17, 21-19 win over the Chinese ace as it was his first title on Malaysian soil. "This win is very special to me. It is the first time I have won a title on Malaysian soil...and a good start to the year," said Wan-ho. The Chinese ace, however, still leads 11-5 in the head-to-head count against the Korean who has set his sights on the 2020 Tokyo Olympics. Japan once again showed their might in the women's doubles and the mixed doubles. Top ranked Yui Fukushima-Sayaka Hirota came back from a game down to beat Indonesia's rising pair Greysia Polii-Apriyani Rahayu 18-21, 21-16, 21-16 in the women's doubles in a marathon. The 76-minute encounter was worth USD27,650 in prize money for the champions while the losers took home USD13,300 for their efforts. 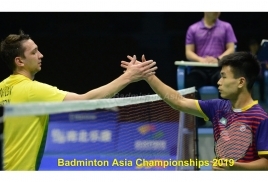 Japan also reigned supreme in the mixed doubles with reigning All-England champions and top seeds Yuta Watanabe-Arisa Higashino handing Thailand's second seeds Dechapol Puavaranukroh-Sapsiree Taerattanachai a 21-18, 21-18 defeat. For the Thais it was their second successive heartbreak in two weeks. They were also on the losing end in the Thailand Masters in Bangkok where they lost to Malaysia's Chan Peng Soon-Goh Liu Ying in the final. Indonesia celebrated the men's doubles with the top ranked Marcus Fernaldi Gideon-Kevin Sanjaya Sukamuljo denying Malaysia's youngsters Ong Yew Sin-Teo Ee Yi with a 21-115, 21-16 win in a 35-minute thriller.